US President Donald Trump’s address to the National Assembly was longer than expected, lasting 33 minutes and punctuated by 22 rounds of applauses and standing ovations at the beginning and end. Hours before he arrived for the much-anticipated speech, originally scheduled for 11 a.m. but delayed by about 20 minutes, the atmosphere in and outside the National Assembly was tense. 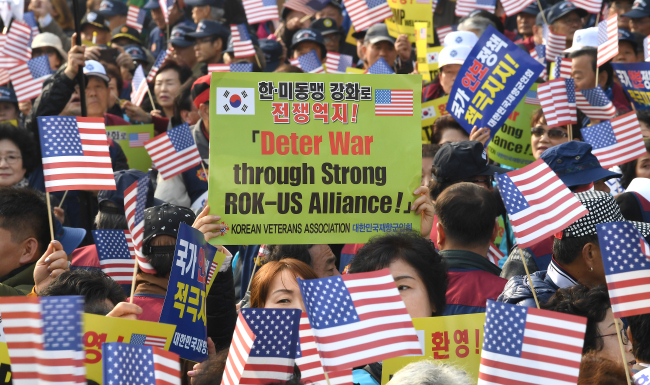 Protesters rallying for and against Trump clashed outside the parliamentary building in Yeouido, Seoul, a reminder of a society split on how to view the outspoken US leader who at times has threatened to take military action against North Korea, which many here believe would lead to tremendous losses of life in Korea. As US President Trump and first lady Melania Trump entered the Assembly Chamber at 11:20 a.m., parliamentarians and the audience stood -- many of them holding out their smartphone to take photos. 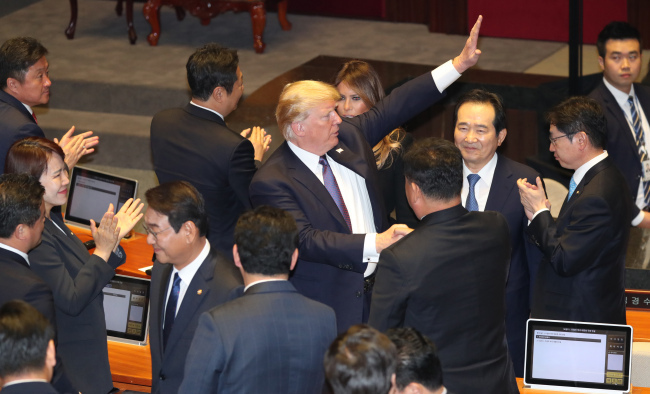 Wearing a blue tie and US flag pin, Trump exchanged nods with National Assembly Speaker Chung Sye-kyun and took the podium in front of an audience of 550, including 299 lawmakers and specially invited guests. Trump, in the first part of his speech, stressed the importance of the Korea-US alliance and to highlight the remarkable achievement that S. Korea has made in both economy and democracy since the 1950-53 Korean War. He described how South Korea climbed from “total devastation” to become one of “the greatest nations on Earth,” continuing the pleasant mood. When the US leader talked about South Korean golfers leading the US Open competitions, both applause and laughter filled the chamber. As Trump finally moved on to North Korea, the widely expected main topic of the speech, some expressions in the audience turned grim. When he talked of “peace through strength” and the end of US tolerance for N. Korean provocations and threats, some liberal politicians expressed their uneasiness by withholding applause. 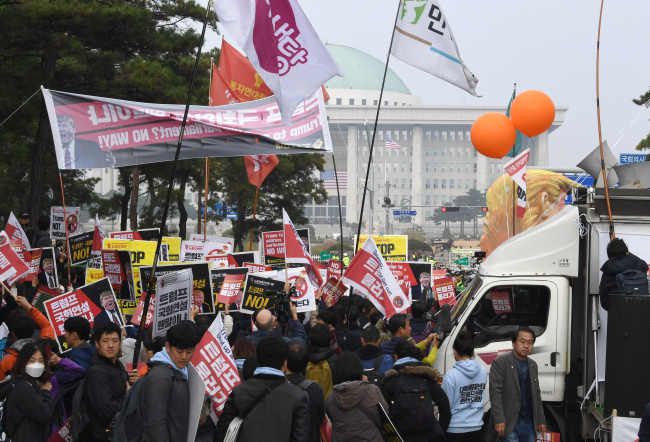 Two lawmakers, Rep. Yoon Jong-o and Kim Jong-hoon of the progressive Minjung Party, did not applaud through the speech at all. The two have been critical of the United States’ approach to the North. They held out a placard after the speech ended. The National Assembly was at its highest security level, with entry to the main buildings and Members’ Office Building strictly controlled. No cars could enter the area without permits. For the Assembly buildings, some 8,000 security guards and police officers were positioned. As the rallies intensified, a group of protestors from the two sides clashed, exchanging insults and punches, but were soon stopped by police. According to police, 18,860 officers were deployed around the National Assembly. The last US leader to speak at the Assembly was Bill Clinton in 1994. He spoke for 22 minutes and received seven rounds of applause.